I don't have any affiliation with Philips Norelco, but I felt like they must have been listening directly to me when they released the S8950 earlier this year. This razor has the best shave from their top of the line electric razors for a fraction of the price. As I describe in more detail in my guide to buying a men's electric shaver, there's only one feature of an electric razor that matters – the shaving head. Even though Philips Norelco has 50 modern models of face shavers, they only make 7 different heads. This means that they're selling 7 electric shavers and 43 different variations of screens, chrome, and colors. To get the best razor for the best value, you need to buy the cheapest unit with the best head you can afford. The S9721 costs more than twice as much as the S8950, but they use the same shaving head. All you're paying for with the more expensive unit is the cleaning system (which you don't need), carrying case, some chrome, and a fancier screen. If you're trying to buy a really nice gift for someone, then it's worth the premium. Otherwise, you can save nearly $200 by going with the S8950 instead. Additionally, the S8950 includes a beard trimmer that is superior to the ones they normally include. On most models (including the high end ones), they only include a little straight shaver that pops out of the side. 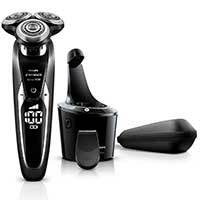 On the S8950, they included a more serious version that temporarily replaces the shaving head. This proper beard trimmer can fully replace a dedidicated beard trimmer. Very few consumers have any idea what shaving head their electric razor takes until it comes time for a replacement. Therefore, they would have no way of knowing that these units are functionally equivalent. They don't advertise the S8950. The only reference to this entire model line is for a page that provides a PDF of the user manual. Normally it is a major red flag when a manufacturer disowns one of their products, but you're safe in this case because you still get a good warranty and high quality product. They do this so that their significant brick-and-mortar retail business won't suffer as a result. Amazon appears to be the only retailer offering this model. While Amazon likely is one of their largest distribution channels, the more expensive models don't have competition from this more affordable sibling at other retailers. As a sidenote, Amazon is selling two different versions of the S8950. The standard version includes the electric shaver, beard trimmer, and charger. The more expensive version also includes the cleaning stand. You can read in my comprehensive guide to electric razors why you don't need one of these. As someone who has been reviewing electric shavers for years, you can take it from me that you're not going to find a better deal this holiday season. Whether you're buying an electric shaver for yourself or as a gift, go with the Philips Norelco S8950.